Lycamobile is the world’s largest MVNO helping over 12 million customers across 18 countries make affordable international and national calls. With Lycamobile you can enjoy fantastic call rates and stay in touch for longer with the most important people in your world whether they are in Africa, Asia, Europe or the Americas. 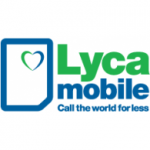 Renowned for providing high quality affordable international and national calls Lycamobile is proud to welcome a new customer to its growing family every 2 seconds. The Lycamobile team is committed to our vision to be a world-class mobile telecommunications company, where our talented people team up with our business partners to continually drive down costs and deliver superior value propositions to our customers.